We’ve jumped onto the Anna bandwagon! Howdy! Apologies if you are sick to death of looking at By Hand London Anna dresses; I know they have been popping up all over the blogosphere since the pattern was released. Personally, I don’t think I will ever tire of looking at other people’s creations and I have been swooning over all of your fantastic versions of this dress! Luckily for me, for my birthday this year my co-blogger Julia bought me the pattern (and bought one for herself too) and we have joined the throngs of sewists who have fallen in love with Anna. I mean seriously, how EASY and QUICK is she to put together?! No interfacing, no stay-stitching, a one-piece bodice front with pleats instead of darts…and a generous fit over even the more ample-bosomed among us. I didn’t have to make any alterations to this to get my perfect fit. I just couldn’t be happier with the pattern. 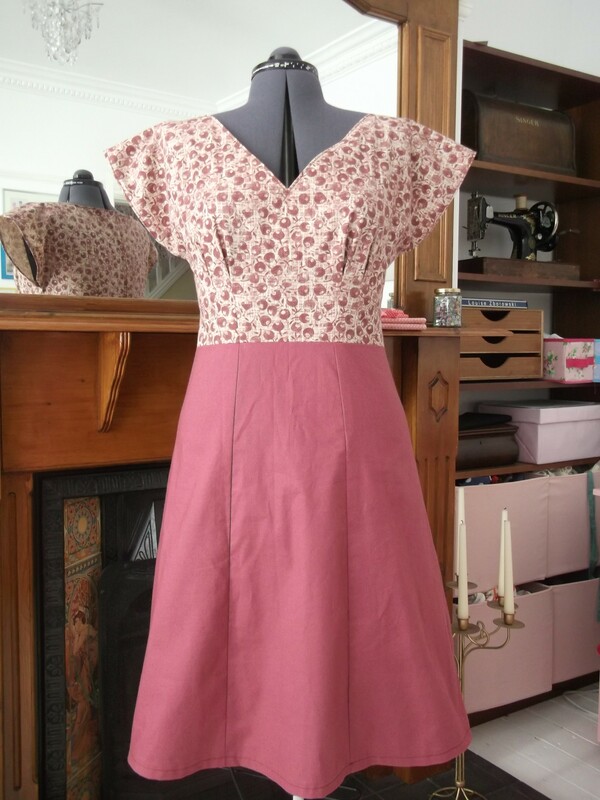 Today I want to show you my first By Hand London Anna dress, made in November. This being my first attempt, naturally it began life as a toile, so I used some cherry print fabric I got at a fabric swap which wasn’t enough to make a whole dress with. 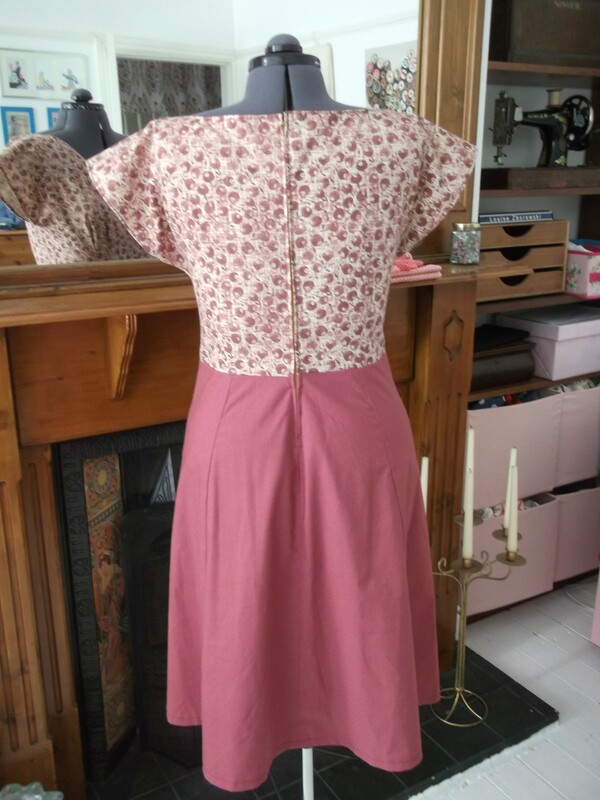 When I finished the bodice, it fit nicely and I really liked it, and so I dug out some co-ordinating plain fabric for the skirt in my stash (which I had originally bought for a Colette Pastille dress, but I never got round to making that one). I had never envisaged making a dress like this, with a contrast bodice, and I wasn’t really sure if it was going to work, but I decided to just sew it up anyway. 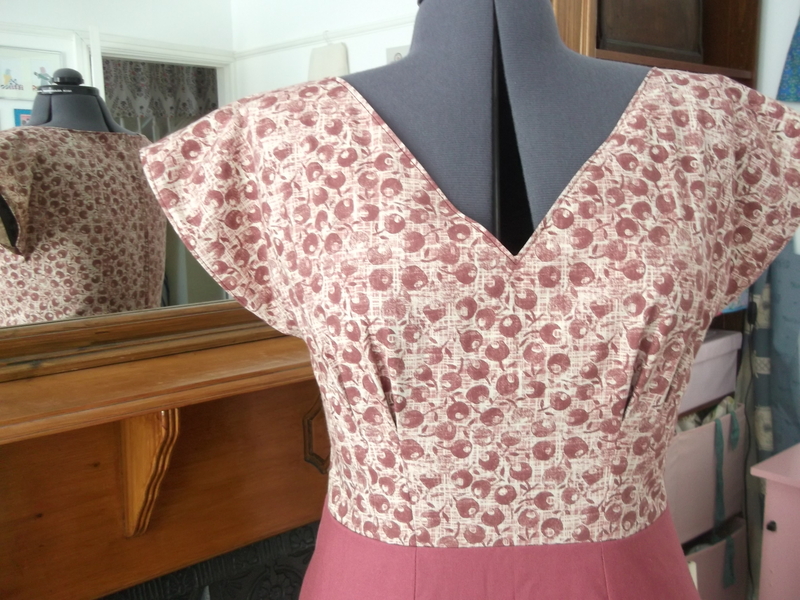 My back-up plan was that if it didn’t look quite right, I would make a bodice from the plain fabric and have a plain Anna dress instead – after all, the cherry print was only meant to be a toile. I opted for the V-neck version, having made Simplicity 2444 and the Colette Peony recently, I wanted a change of neck-line. When the dress was finished, I still wasn’t 100% sure about the contrast bodice, so I posted photos on Twitter and Facebook asking for opinions, and left the finished dress on Delilah in my sewing room until I had decided what to do with it. Thanks! Sorry to hear your current project isn’t going too well. Hope it turns out nicely in the end! The Anna would be a great dress to make next because it is so simple but so pretty! Love the two different fabrics you used! Changes up the look of the dress. It definitely does change the look of the dress! Glad my friend liked it so much. Love it! What a kind friend you are! Thanks Anne 🙂 I’m glad to know she really likes it. Oooh! I totally love this in a with a contrast fabric, it really adds a fun new dimension to an already great shape.